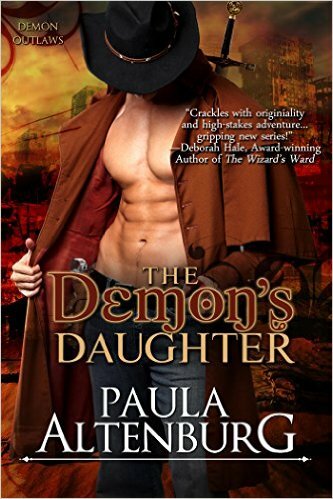 The Demon’s Daughter is a 2013 novel from Paula Altenburg. This is the first of three books in her Demons and Outlaws trilogy, from Entangled Select. These are marketed as paranormal romance (note the cover), but this first one, at least, is more fantasy than romance. A friend who never reads romance, but does read a lot of fantasy and science-fiction, read this and enjoyed it. The stories are set in a post-apocalyptic world. Some of the background details, scheming characters, and power struggle sub-plots reminded me of Tanith Lee’s Night’s Master and Death’s Master. This is a very different story than the last Altenburg I read, Her Secret, His Surprise. Earth, or at least an isolated section of it, became a battleground between more or less immortals – goddesses and demons (all male). Much of humanity was wiped out, and hundreds of years later there are deserts over cities, where collapsing buildings form deadly sinkholes. What society exists is similar to the western frontier, though it would be a stretch to call the book a futuristic western. By the time of the first story, the goddesses are gone, and the demon numbers are declining. One of the hazards of this world is the demons’ attraction to human women. The monstrous offspring of these unions generally kill their mothers, in a gory fashion, and are themselves killed as soon as possible. The titular demon’s daughter is an unusual case. She is the result of an affair between a goddess and a demon, and the other stories also apparently feature unusual progeny. The hero, Hunter, is known as the Demon Slayer for his success in killing demons. A manipulative priestess hires him to capture and bring in a local marauder. The priestess knows the marauder is a demon’s daughter, but does not share that with Hunter. Hunter has no trouble finding her, but as he learns about her, he becomes reluctant to carry out his assigned task. The romance plot is of course the growing attraction between Hunter and Airie, but most of the story is driven by Airie’s father and the priestess both wanting her, for their own reasons. Dragons are more dangerous, and a good deal commoner, than bears. Fantasy is nearer to poetry, to mysticism, and to insanity than naturalistic fiction is. It is a real wilderness, and those who go there should not feel too safe. Readers – and writers – should know and understand this. Airie is special, and has a role to play in saving the world, but she does not start out as ordinary. She starts out as the kind of character I love – a strong, independent, and resourceful woman, and she retains her independence throughout the story. At the same time, she has multiple symbolic functions. There are no literal dragons in The Demon’s Daughter, but the demons, goddesses, and outlaws provide plenty of material for the reader looking to wander in the wilderness. I am keen to read the others in this series, partly because of the unresolved plot threads, and partly because it is enjoyable reading. I am also hoping to learn more about the world Altenburg has created. For example, how did women become so oppressed in this society, and why they don’t just get abortions rather than await the inevitable after the irresistible encounter with a demon? However, the sequels may have a greater emphasis on romance, as suggested by the teaser for the next book. Whether it is fantasy or romance, I look forward to reading it.